AUSTIN TX September 11–21 2014 - Gallery dedicated to multimedia and multicultural art by women. Women & Their Work has been featured in The New York Times, the Huffington Post, the Atlantic Monthly, Art In America, Art Papers, and on National Public Radio. Through more than 50 events each year, their work serves as a catalyst for new ideas in contemporary art. This is a great chance to see a huge range of work from Texas and beyond. Hosted by Crocker Art Museum. Located at 216 O Street, Sacramento, CA. This artful evening features work by more than 100 of the region's finest artists, and includes a silent auction followed by a gourmet dinner and an exciting live auction. Casually elegant attire. SACRAMENTO CA March–April 2013 - Gallery 2110 - "Myths, Legends and Prophecies"
The exhibition showcases the work of twenty-one artists from the Northern California region (bay area, central valley, and foothill) who will interpret/re-create, the myths, legends or prophecies of various cultures. FOLSOM CA February 9 – March 10, 2013 - Featured Artist. On display are Gwyn's contemporary works from her series The Blue Wave Train. OAKLAND CA February 1, 2013 - March, 16 2013 TRANSMISSION GALLERY, a new contemporary art gallery, announces plans for their fourth exhibition since opening August 2012. The new exhibit, Layers, opens Friday February 1, 2013 from 6-9pm. All are welcome to attend the opening reception. A whimsical piece—Blue Waves w/ Cat in Cage—by artist Gwyn Stramler is one of 75 finalists chosen for The 2012 Crocker-Kingsley Biennial Competition/Exhibition. Finalists have been selected by juror Michael Duncan, corresponding editor for Art in America Magazine. 1st, 2nd and 3rd place Award Winners will be announced during the Opening Reception November 17, 2012 from 7–9pm. All are welcome to attend the Opening Reception. October 6 & 7, 13 & 14 (Free Event) Saturday & Sunday 10 a.m. to 5 p.m. Visit 67 local artists in 34 studios this October and see where art is made, displayed, and appreciated in Nevada County. Meet the artists and experience first-hand how, where and why art is created. 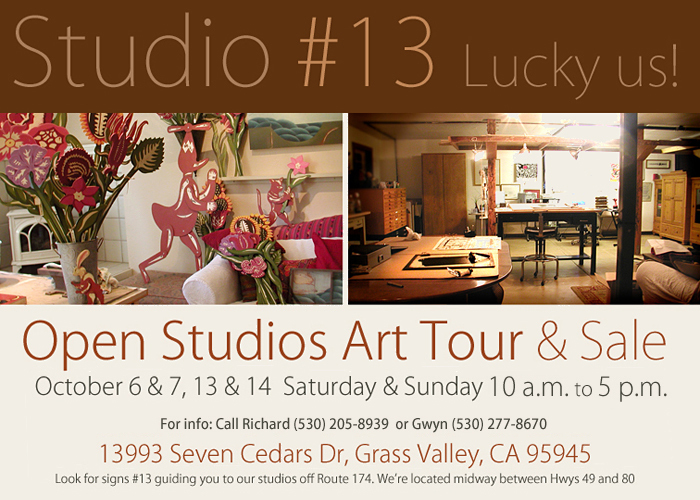 For more info and a guide to the artist's studios visit The Center for The Arts in Grass Valley, CA. When: Saturday, June 2, 2012 | 5:30 until 10:00 p.m.
Art Auction is the best opportunity of the year to collect works of art by the region's most distinguished artists. The casually elegant evening begins with a silent auction in the second floor galleries, followed by a gourmet dinner and an exciting live auction. When: Thursday, May24, 2012 | 6:00 until 9:00 p.m.
Meet the artist at Big Names Small Art, a silent auction party that kicks off Art Auction Season at the Crocker. Proceeds support the exhibitions and education programs of the Crocker Art Museum.